This Harry Potter four piece dinner set features the crest of the famous Hogwarts School of Witchcraft and Wizardry. 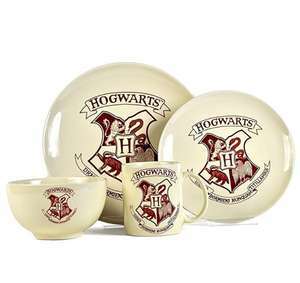 The set is comprised of everything needed for a meal - a dinner plate, side plate, bowl and mug - and makes a magical gift for any Harry Potter fan. Code doesn’t work for me heat added anyway. code not working for me either . What is the price with code as it is £24 without code and was wondering with the code what it is? thank you. Makes sense...but i missed it .